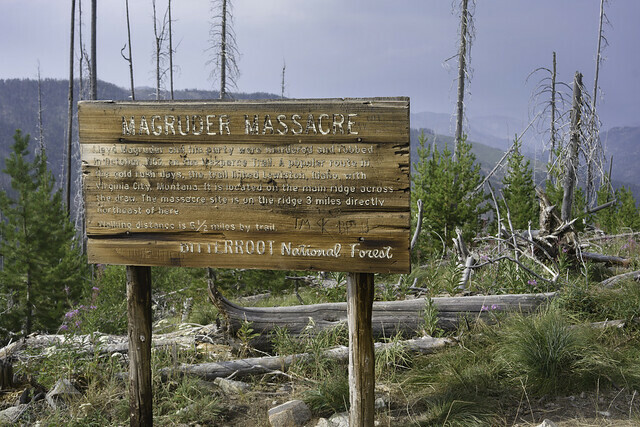 Massacre | Flickr - Photo Sharing! I hustle to continue on, stopping only a moment at the road’s namesake site marked by a sign explaining the 1863 history of Lloyd Magruder. The road descends from here to the Selway. I’ve caught a few glimpses of the river between the trees far below so I know it won’t be long. I’m glad we’re getting there fairly early. I enjoy having time to visit with my brothers around the fire. I’ll stop and wait for them once I get to the river.